Thank you for reading SHOTOKAN WORLD NEWS. 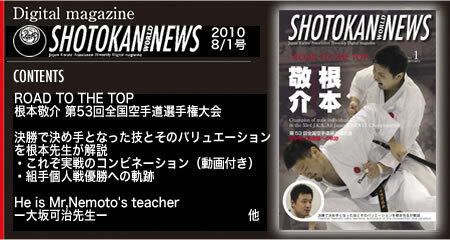 We'd like to inform you that SHOTOKAN WORLD NEWS have combined with JKA News. SHOTOKAN WORLD NEWS 2014 July edition will be its final issue. After that, Free JKA News (Japanese/English) will be published on the JKA website. We will pay back for the overpayment. Copyright(c) 2019 SHOTOKAN WORLD NEWS All Right Reserved.